Ducati has unveiled the 959 Panigale Corse model before the EICMA 2017 begins. The Italian motorcycle maker is already showcasing the Panigale V4 and the bigger 1,100cc scrambler engine, here is the Ducati 959 Panigale Corse model to appease you once more. New edition in Corse range of Ducati has replaced the regular tradition of the motorcycles in this bracket. With the new edition, customers will get the same engine and power wrapped in some appealing and updated features. 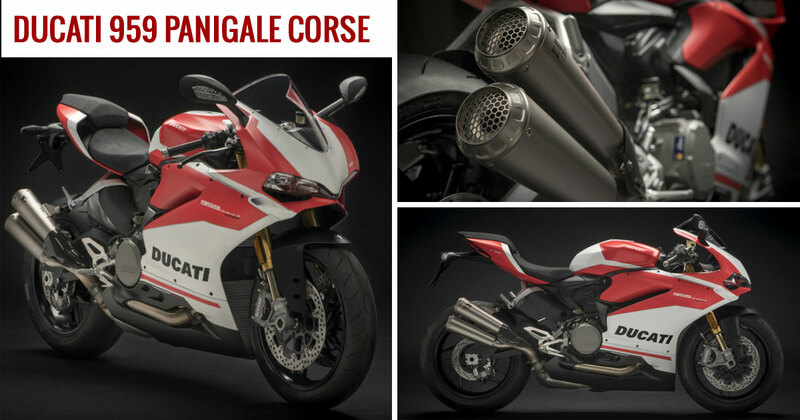 One of the attracting features of the new Ducati 959 Panigale Corse is MotoGP derived color scheme and accepted Akrapovic exhaust. The bike is equipped with a host of dynamic updates and modified adjustable steering damper which owns an Ohlins unit. It also includes highest performing Ohlins NIX30 43mm USD forks at the front and Ohlins TTX36 off-set spring at the rear end. The new 959 Panigale is powered by a 955cc L-twin engine following the trail of standard 959 Panigale and able to churn out a maximum power of 147 BHP at 10,500 RPM and maximum torque of 102 Nm at 9,000 RPM. It weighs 195 kg which is 2.5kg less than the standard 959 Panigale. The bike extends the features by adding traction control, ABS, quickshifter, ride-by-wire, engine brake control, and three riding modes including Race, Wet and Sport. The standard 959 Panigale is available in India so we could expect that the new 959 Panigale Corse edition will be available in India. The bike is expected to be available in the showroom globally from February 2018.